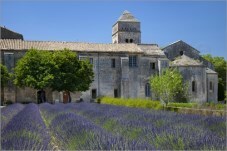 You are cordially invited to join us on our Painting Holiday in Provence where you will receive expert guidance throughout from one of the UKs leading art tutors - Soraya French. 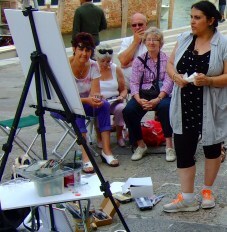 You are welcome to paint and receive tuition in the media of your choice, however, Soraya's group demonstrations will be in acrylic. produced many of his most celebrated works. We are always close to cafe's for coffees, lunches and toilet facilities during the painting day. Your accommodation has been reserved on a bed & breakfast basis at the Hotel Bristol in the heart of old walled town area of Avignon. 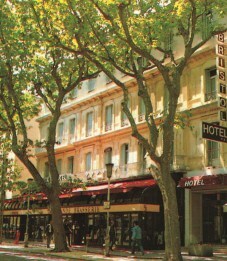 The Hotel Bristol is ideally located in a beautiful tree lined avenue just a few minutes walk from the Pope's Palace, the gardens overlooking the famous Bridge and Avignon's historic centre. All hotel rooms are ensuite together with a safe, air conditioning, TV, fridge and hairdryer. Price is based on two people sharing a twin room on a Bed and Breakfast basis and includes tuition, return Eurostar rail travel from St Pancras to Avignon (via Lille) and private coach excursions to our chosen painting locations. Just because we are booked at the hotel on a B&B basis does not mean that you need to fend for yourself in the evenings, we will arrange a table for evening meals for the group at local restaurants in the old town area of Avignon during the course of the week for a drink and a meal. Whilst not part of the course it is an enjoyable way to round off the painting day! As with all West Norfolk Arts Centre painting courses, Richard Cartwright will be on hand to deal with any non painting aspects of the course leaving your tutor free to provide the high standards of tuition you expect. fee when sharing your accommodation subject to availability. We ask that you either call us on 01553 631689 or email us to check course availability. This course has been arranged for West Norfolk Arts Centre by Travel Editions Ltd who are ABTA and ATOL bonded agents.